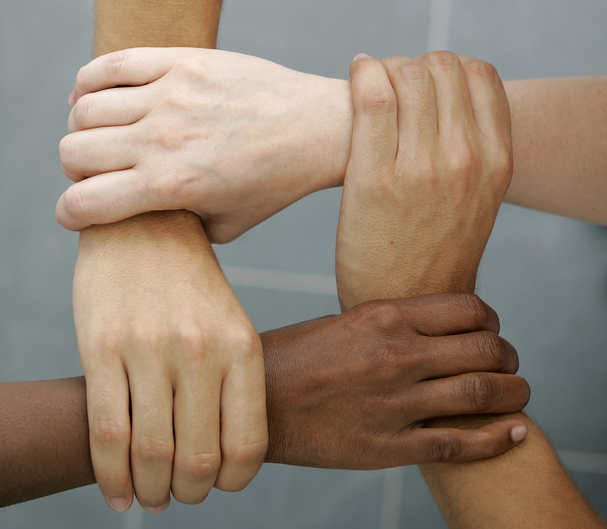 Article by JD Adler, Video by Arnaud Girard and Naja Girard…. 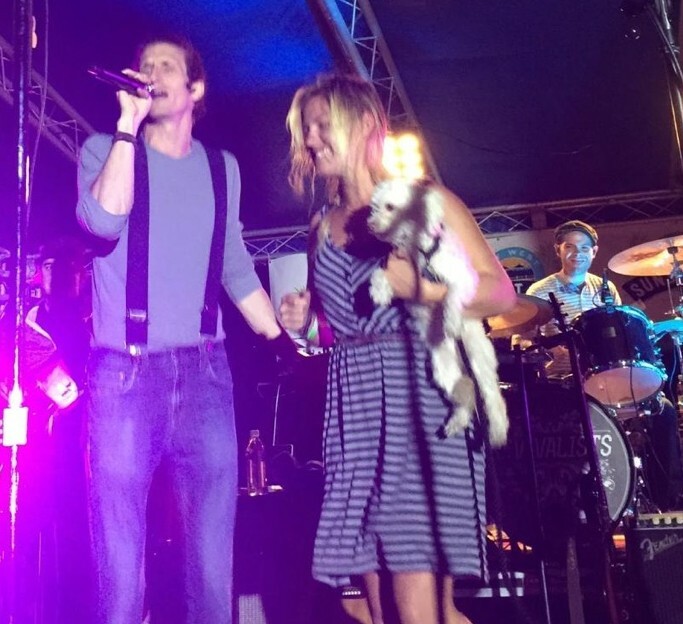 Saturday, February 7th, 2015: Key West native and charter boat captain, Kelsey Haas, heads to the Ocean Key Resort & Spa with her dog Mali to see one of her favorite bands, The Revivalists, perform on Sunset Pier at the foot of Duval Street. The band, transfixed by the cute little doggie, invites her onto the stage. After dancing for a few joyful minutes, Kelsey and Mali return to the floor. Facing the stage, she suddenly finds Officer Janeth Calvert, working off-duty as security, grabbing her from behind and demanding she leave the “VIP-only” section. According to Kelsey, Mali was knocked loose from Kelsey’s arm, skittering across the wooden deck and Kelsey reached out for her companion. Calvert maintains in her report that Kelsey pulled away and resisted, justifying the rough takedown that followed, “I then grabbed her by her right arm and took her to the ground with a straight arm-bar takedown. Haas went straight to the ground. 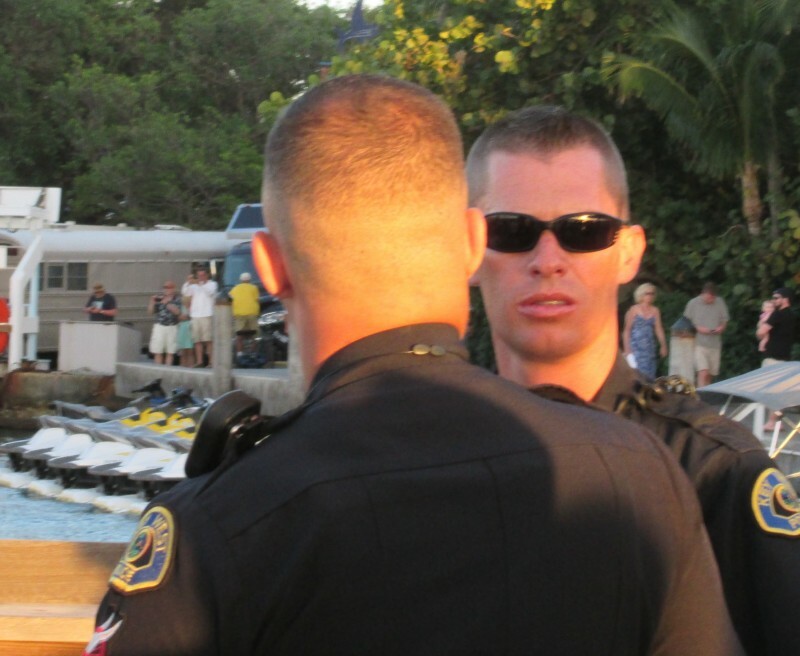 During the takedown, Haas scuffed both of her knees on the wooden pier.” Kelsey is cuffed, and dragged through the crowd by three officers of the KWPD where she sits, embarrassed in hand-cuffs, at the entrance of the crowded resort. The band stops playing and asks if this is really necessary, reminding the officers they invited Kelsey on stage. They initiate a “Free Dog Lady!” chant that the whole crowd joins in on. Her friend and work manager, Joanne Palmieri, witnesses Kelsey in cuffs and follows. She offers to take Kelsey home, then notices the empty leash dangling from an officer’s hand and retrieves it so she can go find Mali lost somewhere in the crowd. Calvert first tells Joanne she wasn’t going to actually charge Kelsey, but later decides that Kelsey’s “resisting” made it necessary. While Joanne is speaking with the officers, a representative from the band comes up and again reminds them they had invited Kelsey on stage. This witness statement is not recorded by the KWPD. After sitting on public display in front of the hotel for an hour, Kelsey would eventually be dragged off to the Monroe County Jail and charged with Trespassing (failure to leave) and Resisting Arrest. Upon further investigation, it appears that Kelsey was not “trespassing” at all. 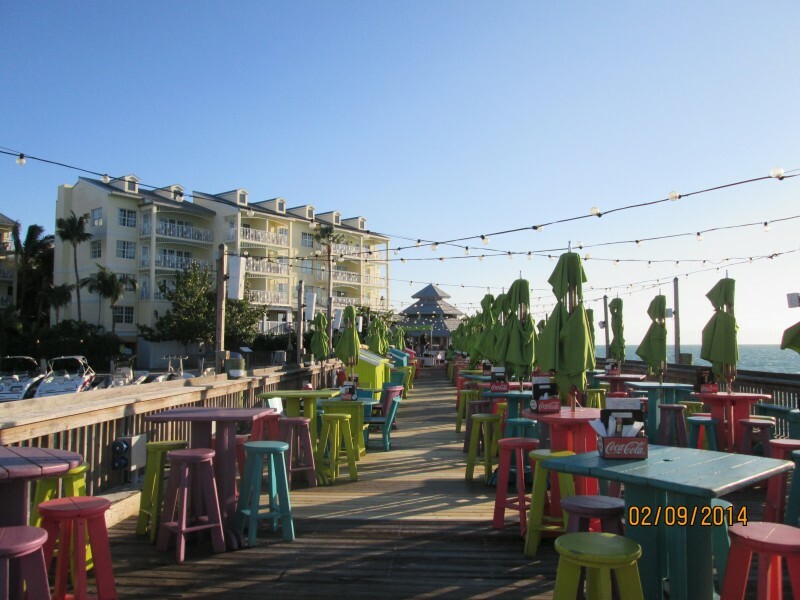 The Sunset Pier is on public land owned by the state of Florida and leased to Ocean Key. There is history dating back to the 1980s documenting such (more detail on that in the sections below). 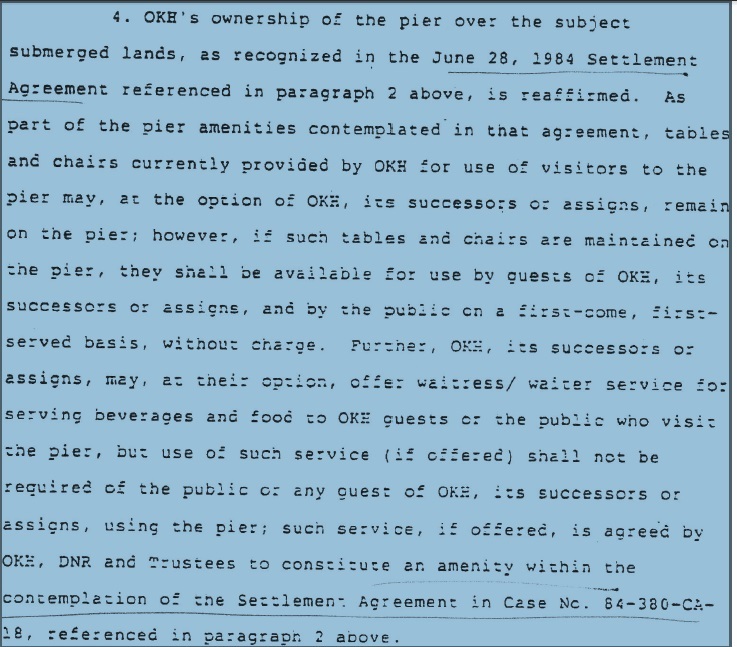 Immediately relevant to Kelsey’s arrest is the section of the current lease which stipulates that Ocean Key must keep the pier open to the public. “29C The Dock Shall be Open to the General Public at no Charge.” And Section 29G which states that they are allowed to hold 12 “private events” per year, and 1 public, for charity event per month. This is only one part of the story. What began with an investigation into whether or not it was appropriate to arrest this Key West resident for trespassing on public land appears to have opened up the proverbial can of worms. The current general manager, Matt Trahan, is named in some of those reports, dating back before his current promotion in 2012, so it would appear he is familiar with the terms of the lease. 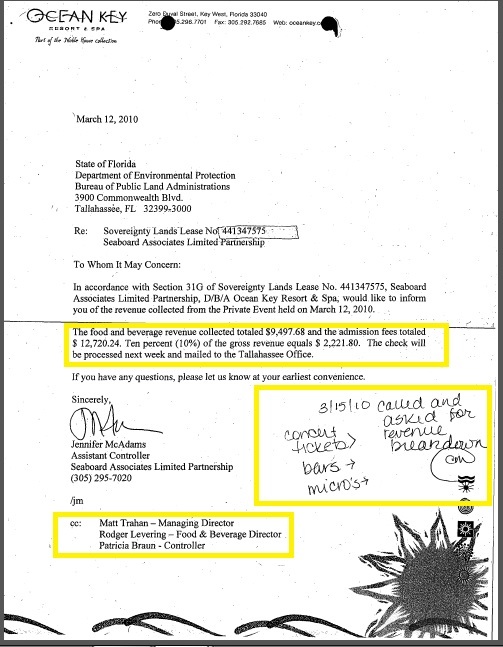 We also learned from these records that Ocean Key has referred to these for-profit concerts as “private events” in the past and that for the last two years they have not notified or paid the state for any events at all. 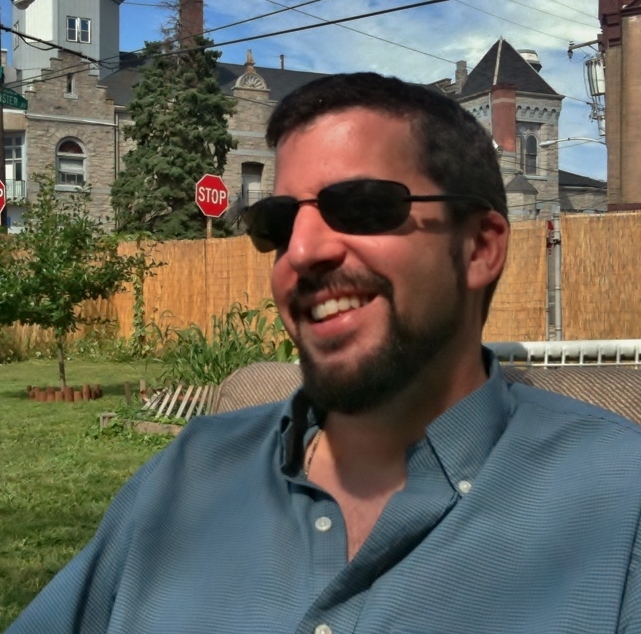 It would also appear that Officer Calvert, who would not be expected to know the terms of the lease, was used by the hotel to enforce what appears to be a prohibited use of a public area. In a perfect world, one would expect the officer to inform the hotel that the pier was public land and not only defend Kelsey’s right to be there, but also prevent the hotel from charging the public for access to the pier. In fact, Ocean Key, and its parent company Noble House (a Washington state based company with hotels, marinas and spas all over the US), earns a sizable sum of cash during these events. According to their own Facebook events page, Ocean Key had at least 19 non-charity concerts in 2014 alone, an apparent violation of their lease by itself which only allows for 12 “private events” per year and 1 “charity event” per month. Since these concerts appear to have been neither “charitable” nor “private” events and since the hotel did not provide the state with the required notice and portion of the revenue, it appears there may be a significant amount of money owed. Using one event from the reports DEP provided, September 2010, as the benchmark for a rough estimate, at which they grossed $22,217.92 and paid the state $2,221.80, and multiplying that by 19 for just the year 2014 it appears the state could be owed in the neighborhood of $42,200 for 2014 alone. Some events, of course, earn more than others. At the Feb 7, 2015 event that Kesley and Mali attended, the hotel charged the public $150 to enter a “VIP-only” section with a max capacity of 75 which amounts to $11,250 gross. In addition, the main area which could accommodate hundreds of patrons, cost $20 to enter. Drinks sold during an event can cost $6/beer, $8/mixed drink. Meanwhile other events are free to enter, but still produce concession revenue. 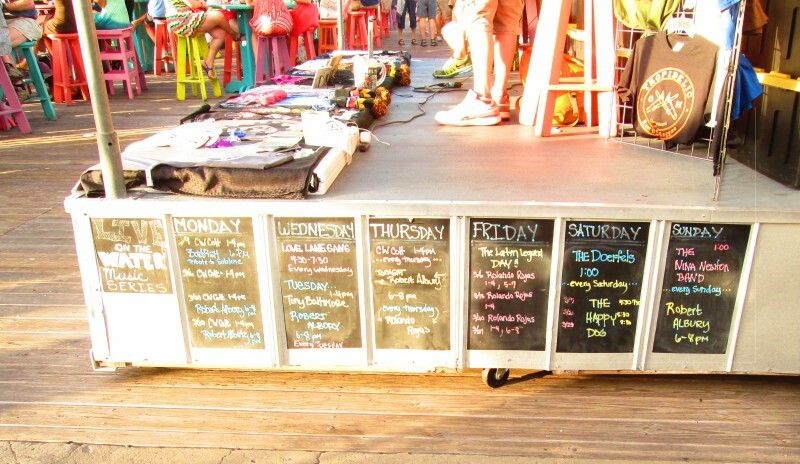 On most days of the week there is a band playing on the pier during happy hour, bringing in additional business with enhanced sale of drinks. It is difficult to tabulate an exact accounting, but it is not impossible to reach a rough estimate of gross revenue directly resulting from these events in the hundreds of thousands. 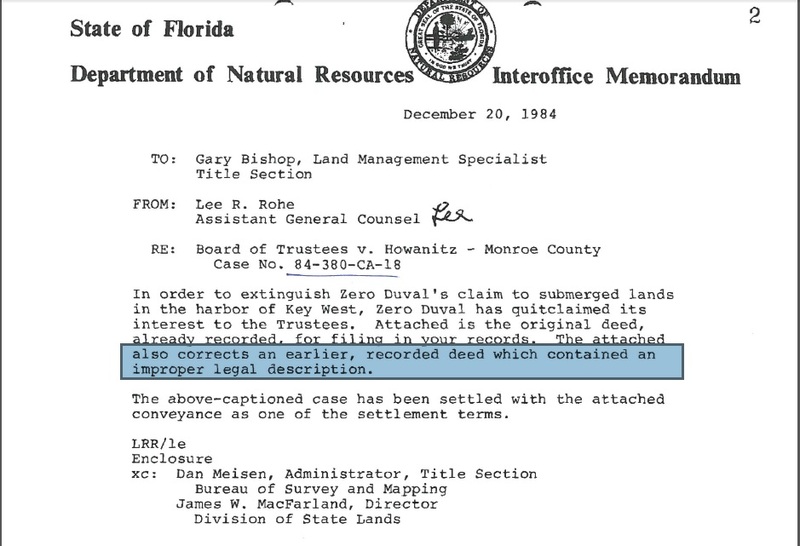 After two lawsuits with the state in the 80’s, heckling from an activist in the 90’s, and what appears to be somewhat random compliance over the years; the owners of the pier at “Zero Duval” once again appear to have difficulty with the concept of public land and public rights. General Manager, Matt Trahan, at Ocean Key was contacted multiple times to set up an interview. To date, he has not agreed. JD Adler is an author of fiction and journalism, holding degrees in English Literature and Publication Management. He has authored non-fiction books and science fiction novels as well as short stories and poetry. As a journalist he has covered national elections, environmental business, criminal trials, and local news.